Thursday March 28th 1901 We did ironing and some baking this morning and I worked all afternoon putting little things to rights in the parlor and somethings up stairs. Friday March 29th 1901 I did baking this morning and got the dinner. Ida was busy too. Will and I went away after an early dinner, he went to town with the butter and I spent the afternoon at home. Mother feels better. a cold cloudy day. Lee would have been 39 years old today if he had lived. Saturday March 30th 1901 The ground was white with snow this morning and it snowed a great part of the day. I had Russell clean the cellar and I was busy sewing on a dress for Ida a part of the day. She cleaned the kitchen some. Mr Zeller was here for dinner he dehorned the cattle. 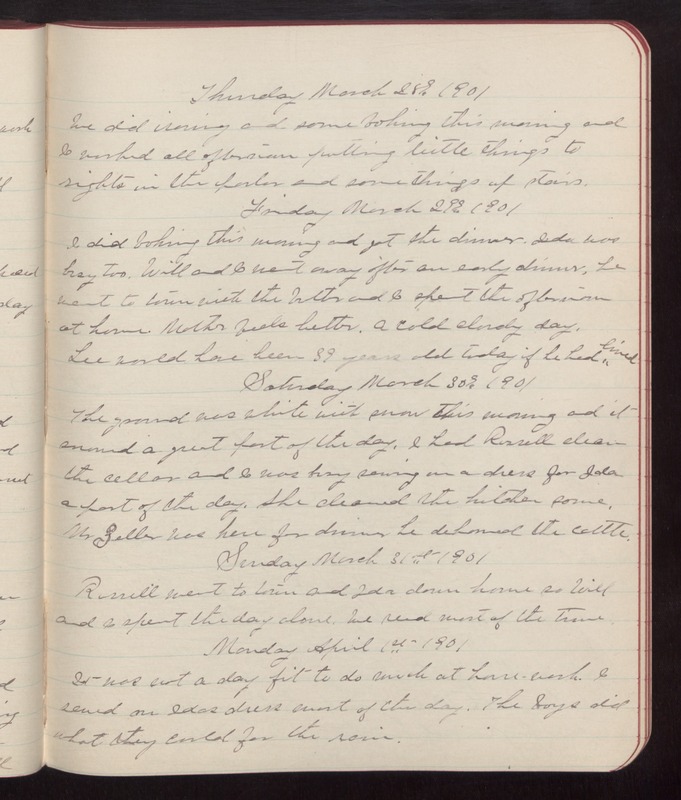 Sunday March 31st 1901 Russell went to town and Ida down home so Will and I spent the day alone. We read most of the time. Monday April 1st 1901 It was not a day fit to do much at house-work. I sewed on Idas dress most of the day. The boys did what they could for the rain.